We eat a lot of baked beans. In fact, just last night, we fired up the grill for the first time this season, dining on meatless hotdogs, grilled little potatoes and a can of baked beans. That’s an easy summer meal and even though there’s not a green vegetable in sight, it’s one of our favorites. I’m a traditionalist when it comes to topping my vegan hotdog or sausage- I pile on lots of sauerkraut and more spicy mustard than should be allowed. BL does the same, plus a dollop of baked beans on top. Seriously, this babe loves baked beans. So why had I never made them before? My mom taught me how to doctor up a can of baked beans when I was in high school (little brown sugar, Dijon mustard and ketchup), but I’ve never made my own sauce and beans from scratch. Until now. This time, using the Instant Pot so we can still enjoy BLs favorite side dish on a weeknight. Obviously, these take more work than opening up a can of beans but the flavor is just as delicious without as much sugar. That’s the downfall with baked beans, their awesome flavor is usually thanks to heaping amounts of corn syrup and brown sugar. 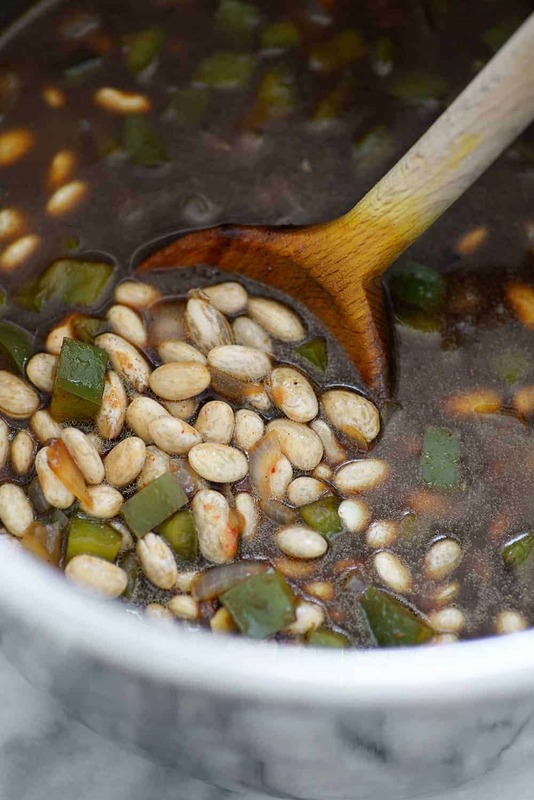 While my beans still have sugar in them, they contain enough spices that intensify the smoky-sweet flavor while still providing a mostly healthy side dish. 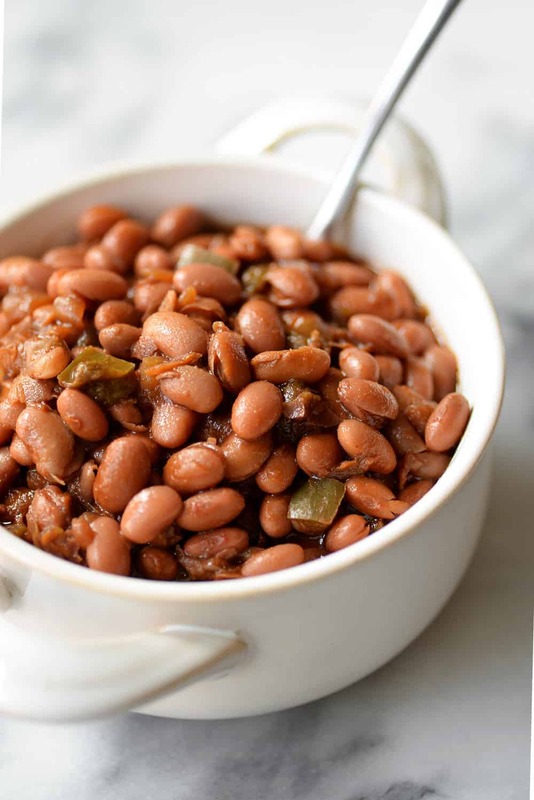 I used dried pinto beans in these, but white beans or navy beans will also work. I believe that’s a more traditional choice but I always have dried pinto beans in my house for pots of chili, so that’s what I used. Dried beans are glorious. And, I’m thankful that the rise of the Instant Pot/Pressure Cooker has made them more in fashion. I know I’m a broken record on this, but I want us all to eat more beans. Just this week, another study came out showing that eating more plant-based proteins over animal protein (specifically red meat) reduced heart disease risk. While this isn’t new science, it did emphasize the protein aspect- not just the fatty acid profile that’s usually the relationship between red meat intake and heart disease risk. Therefore, can we stop with the ‘paleo/keto is healthy’ movement? I pinkie promise that we are not one of the unhealthiest first-world countries because we don’t eat enough protein. 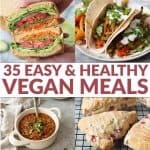 I’m not saying you have to give up meat entirely; there is plenty of evidence that a predominantly plant-based diet is one of the most healthful eating patterns. Instead of the ‘don’t, let’s focus instead on the ‘do’: getting in at least 3+ servings of fruits and vegetables a day, using whole-food fats, like avocado, nuts and seeds to lightly flavor food, and increasing intake of plant-based proteins. Move meat and dairy more to the condiment section. 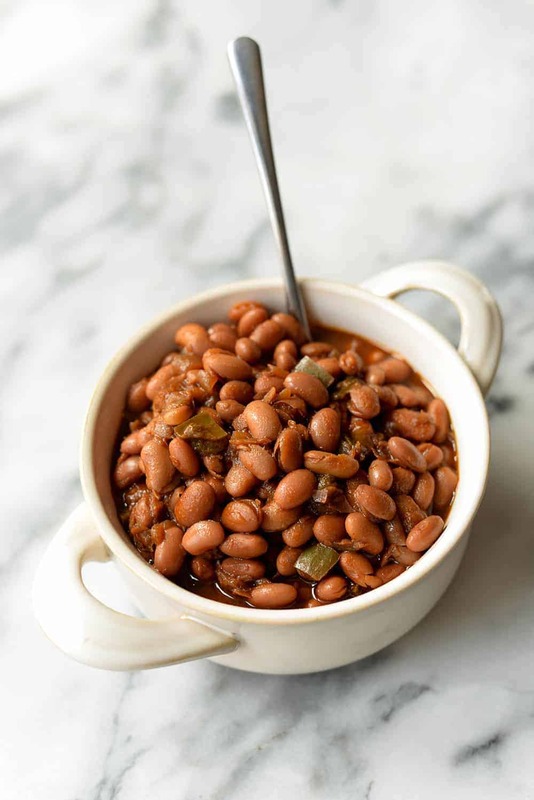 These Instant Pot baked beans are a great way to add in more legumes to your diet. And, while we’re on the subject of health- ‘Blue Zones’ longevity research shows that just ½-1 cup of pulses per day (beans, dried peas and lentils) can add roughly 4 years onto your life. Extra years just for eating beans!? One of the most delicious food groups!? Count me in. Instant Pot Vegan Baked Beans! You’ve gotta make these for your next BBQ! 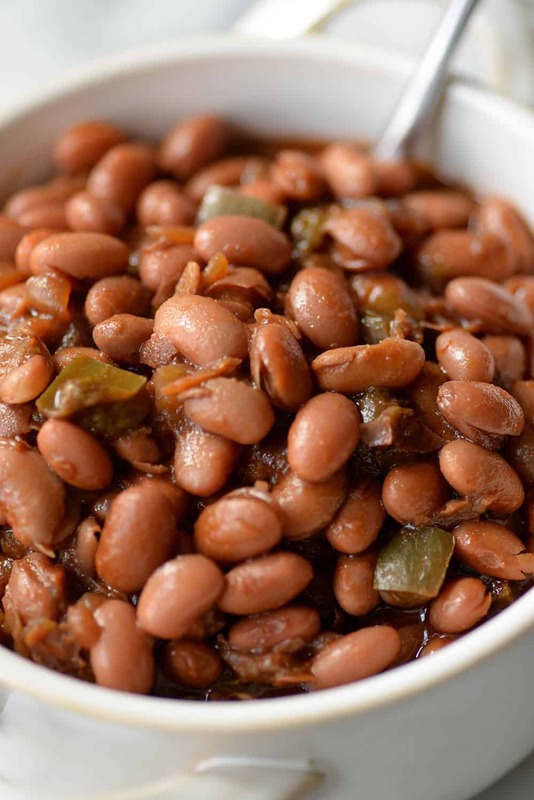 Ready in less than an hour, these beans are so much healthier than the canned variety and packed with plant-based protein and fiber. Vegan and gluten-free. Rinse the beans and sort to remove any debris. 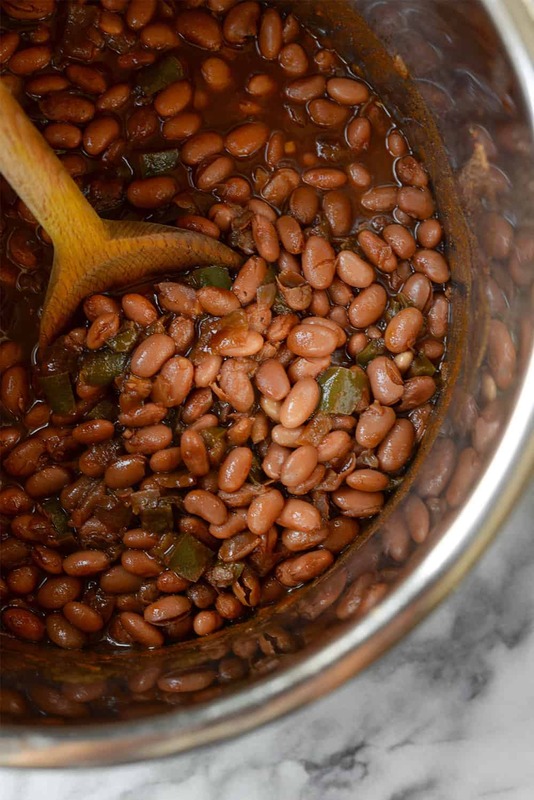 Place the beans in a bowl with 1/2 tablespoon salt and cover with 2-3 inches of water. Let soak overnight or for 8 hours, then drain Alternatively, place beans and 8 cups water in a saucepan and bring to a boil. Let cook for 2 minutes, then remove from heat, cover and let stand for one hour. Drain, then proceed with recipe. Hit saute on the Instant Pot and add the olive oil and the onion. Cook for 2-3 minutes until onion is soft; add the salt, green bell pepper and garlic. Cook another 3-4 minutes until vegetables are tender. Add the rinsed beans, molasses, ketchup, Worcestershire sauce, brown sugar, dry mustard, chili powder, paprika and 2 cups water. Cover and make sure the vent is set to to sealing. Cook on high pressure for 40 minutes. Let sit for 15 minutes, then release the pressure to let the beans come down. Stir in apple cider vinegar. Season to taste, adding more salt if needed. Made these tonight but I already had cooked pinto beans in the freezer from an instant pot cooking week before Christmas. I have never like canned baked beans but I loved these; just a perfect blend of flavors. I followed recipe except after adding all together I simmered for about 1/ 2 hour. I just need to start making all the recipes you email cause they are sooo good. So glad you liked them! Thanks Wendy! We loved this recipe. Made it with large dried white lima beans. The flavors wafted throughout our house all day as I cooked it longer since I don’t have an instant pot. My daughter just had to taste them even though she was going out to dinner. Thanks for another good recipe Alex! Glad you liked them! Thanks Jeanette! 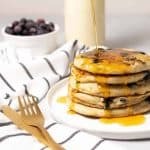 Can I double this recipe and have it still be ok in the instant pot? Hi Kristine- how big is your Instant Pot? I used the 8qt model and it fit perfectly here; doubling it would be too much in that size. Ya, its a 7 qt I made a single batch yesterday and realized a double wouldn’t fit. Thx. Great recipe though. Very yummy! I made this tonight with kidney and limas. Good flavor but sauce not thick enough. Had to add cornstarch.